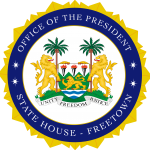 State House, Freetown, Monday 26 November 2018 – A high-level delegation from the United States’ based international humanitarian agency, Catholic Relief Services (CRS) and led by its Vice President of government relations and advocacy, Bill O’Keefe, has met His Excellency President Julius Maada Bio at State House. Country representative for CRS Sierra Leone, Paul Emes, said the US government had made a huge investment in the country’s education sector. He disclosed that the US government had donated $ 25 million to the country to support teacher training, school feeding and nutritional education, water sanitation and hygiene, infrastructure, quality education and literacy. He also said that CRS would launch the school feeding programme in Kabala later this week. “Your Excellency, we are adopting an integrated programme that is aimed at achieving a sustainable school feeding programme because the school lunch attracts children. We are adopting an integrated approach and the aim is to work with the Ministry of Basic Education for the sustenance of the school feeding programme as part of quality school education,” he said. Mr O’Keefe thanked President Bio for the audience. He said he was pleased with the ongoing development projects in the country, describing the free quality education as a laudable venture by the new government. He disclosed that he had sensed progress in the country and that his responsibility was to inform the US government on that progress being made in Sierra Leone. “Sometimes the US leadership does not fully understand the hard work already undertaken by people like you. CRS has been here for a long time and we have stood with Sierra Leone thin and thick. It is really an honour to work with you and to have you lunch the school feeding programme,” he told the President. “We have so many successes around the world which CRS started but later handed over to the people of the country where we operate. We look forward to the children of this country being educated and being able to take up responsibility,” he said. US Ambassador to Sierra Leone, Maria E. Brewer, said: “Thank you, Mr President, for taking time off your busy schedule to meet with us. We are thrilled about the $ 25 million support from the US government for the school feeding programme. The idea that education is the central focus of this administration is a laudable one and we are so excited to be able to launch this project”. On his part, President Bio said he was thankful to the team for their visit to Sierra Leone. He said his government had realised that despite all the efforts in the past, something was missing, adding that so he decided to concentrate on education as the foundation for development. He stated that his government was working hard to catch up with the rest of the world in terms of development with education being at the centre. “On behalf of the people of this country, I want to say thanks to the US government for the support. When we started talking about free education, we knew it was difficult. As an administration, we noticed that everybody was making efforts but education, being the bedrock of development, was missing. So, we decided that among every other thing education was going to be our flagship programme,” he disclosed. “It is an extremely expensive project but because it is so important we consider it an existential issue, which must be tackled to make us relevant in society. We want to make sure that the poorest of the poor share the future that we want to build. I want to say thanks to the US government and CRS for taking up this huge challenge. This is a huge help and we need it to overcome the challenges,” he said. CRS is an American not-for-profit family of human service and development of charitable organisations and projects, connecting those in need with those who care around the world. The organisation is celebrating its 55 years of operations in Sierra Leone.